Our Wild Birds: Too Excited for Words! Ok, I can not contain myself!! Today I scooted home a bit early from the store so that I could watch a movie that I had never seen... "The Runaway" 1961 starring Caesar Romero - excellent movie, but it costars a Greyhound so I may be a bit biased. But I digress. 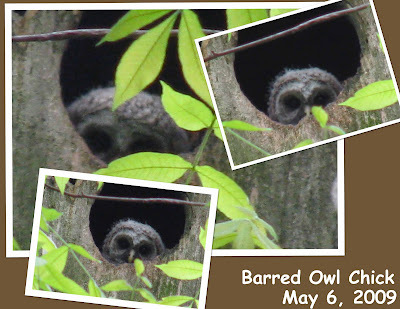 I went upstairs and just happened to look out the window to see if there was any activity at the Barred Owl box. 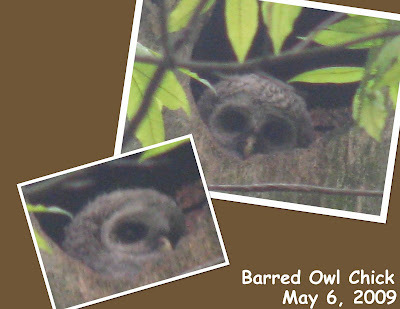 Lo and behold, there was a Barred Owl chick peaking out of the box. These first pics were taken through the window. Not great quality, but s/he sure is cute anyway. I really wanted to get a bit higher quality pics for you all so cranked open the window, and s/he didn't seem to mind too much - though you can see the air of wariness in each of these pics. The end of the movie came and I decided to take the dogs for a walk, and upon returning, it was apparent that this little Owlett was getting ready to experience their world more closely. I ran back upstairs to try to get some more pics. It was about 7:30pm here in the woods -- so a very low light situation for picture taking... oh and I have yet to read the manual that came with my camera so was unsure of the setting that I needed. I LOVE that you can see their little feet in the weirdly blue picture. CUTE! Oh, Pam, that baby is SO cute, and I can't believe you have such a beautiful view of its nest!!! Owls are my favorite bird - ever since I saw a massive Great Horned Owl on a back road in west Texas. Owls are riveting and a baby is just precious. You're so lucky!! Carol - I LOVE the Owls too. I am truely convinced that anyone that hears Owls regularly at their home can get them to nest by putting up the correct Owl Box at the correct height. 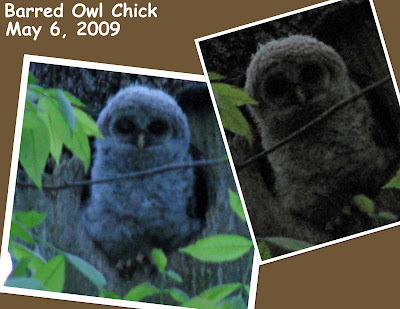 We got our first Owls the second year that we had the box up... That was many years and many Owletts ago.